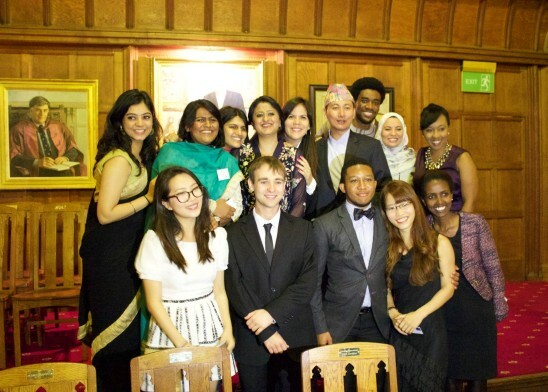 Quratulain (back row, fourth from left) at a special welcome dinner for the new scholars at Harris Manchester. 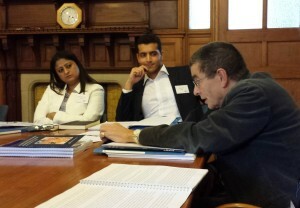 At the start of the academic year, all of the Weidenfeld-Hoffmann scholars came together in Oxford for the Robin Hambro Moral Philosophy Seminar which took place at Harris Manchester College, 26-29 September. The seminar is an opportunity for the scholars to settle into life in Oxford and get to know one another, as well as participating in seminars exploring the moral and philosophical underpinnings of leadership. 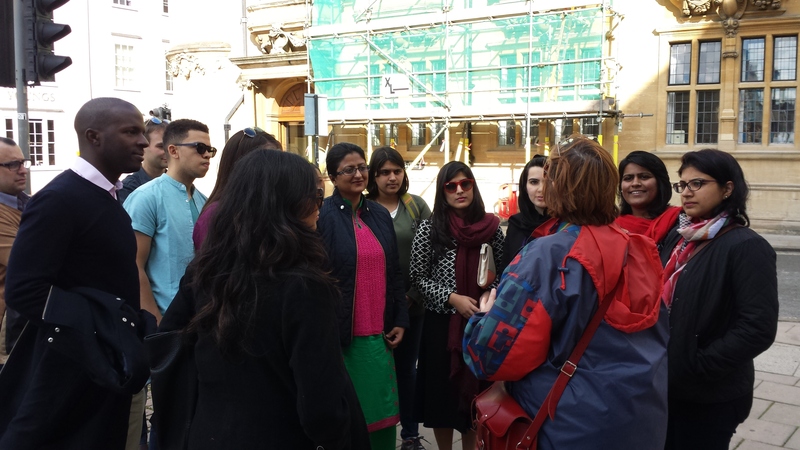 Quratulain Fatima, a Louis Dreyfus Weidenfeld Scholar from Pakistan (MPP), wrote up her reflections on the seminar for the WHT Scholars’ blog. After the rigorous of the selection process and the tedious visa process, the Moral Philosophy seminar and four days spent with my fellow scholars, alumni and academics at the beautiful Harris Manchester College made all the effort worthwhile. Simply put, the Weidenfeld-Hoffmann Community is above all – both personally and educationally – a very enriching experience. With fellow Louis Dreyfus Scholar Karim Aziz and Sir Geoffrey Nice during a Moral Philosophy Seminar. The seminars were extremely thought-provoking. We discussed fundamental themes of liberty, authority, justice and resistance in small groups moderated by renowned academics including Dr John Adamson and Sir Geoffrey Nice QC. In my group – known as ‘Tigger’ – we were challenged to consider different perspectives on governance, development, policy and how we live our lives. Watching the movie Billy Budd encouraged us think about the law and whether upholding it is more precious than an innocent human’s life. Is it acceptable to sacrifice an innocent life if this ultimately brings about a positive change? Nothing could prepare me better for my studies in public policy than analyzing the words of Hobbes or Martin Luther King Jr. Hearing the views of my fellow scholars on these issues – from countries including Egypt, India, Vietnam, South Africa and Ethiopia – was to experience diversity at its very best. The opportunity to meet the incredible Lord Weidenfeld was an honor and his commitment to the cause of education is an inspiration to us all. The mentoring system provided as part of the Leadership Programme – by which we are assigned a mentor from amongst the alumni or continuing scholars – is also tremendously beneficial, enabling us to get advice on all aspects of life in Oxford from our studies, to social opportunities and where to buy the cheap groceries! What else could we ask for? My experience of the Moral Philosophy Seminar not only provided me with knowledge but also helped me to forge long-lasting friendships. During the four days of the seminar we lived alongside our fellow scholars (31 of us in total) and attended nightly social events together. My peers on the Weidenfeld-Hoffmann Programme are now my main support group as I embark upon the hectic academic life of Oxford. I look forward to the Leadership Programme events and talks planned for the coming months, for example I have already had the chance to meet Professor Subroto who spoke on the issue of international development in the context of Indonesia. These opportunities to develop our knowledge are an additional benefit that I will reap over the coming year as a Louis-Dreyfus Weidenfeld Scholar. I believe that leaders are not born, they are made. The Weidenfeld-Hoffmann Trust and the Louis Dreyfus Foundation are doing a great job of making them.